Two families of rockets have been used in Russia to launch lunar and interplanetary spacecraft. The first was based on the R-7, an ICBM developed in the 1950s under chief designer Sergei Korolëv. 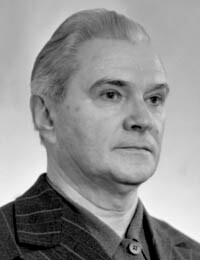 The second was the Proton, developed in the mid 1960s under Vladimir Chelomei. Both of these rockets are in use today. 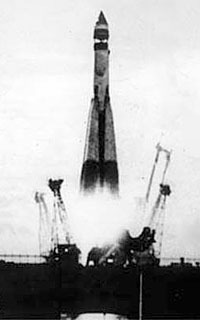 Superior rocket power provided an early advantage to the Soviet space program. The enormous lifting power of the R-7 and Protons permitted enormous spacecrafts, filled with complex scientific experiments. While attempts were made to miniaturize and include more experiments, Soviet scientists were less constrained by weight limitations. 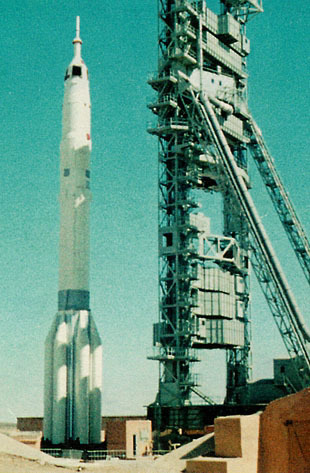 Although the R-7 was the world's first intercontinental ballistic missile, slow launch preparation time (loading liquid oxygen) made it far more important as a scientific rocket. Luna-1 was the first spacecraft to achieve escape velocity, which required the addition of a third stage. In 1959, the 390.2 kilogram Luna-2 became the first man-made object to impact the Moon. Astronomers in Hungary and Sweden believed they witnessed a dust cloud raised by the probe and its 1.5 ton third stage. Vehicles capable of achieving escape velocity are sometimes called "cosmic rockets" in Soviet literature. 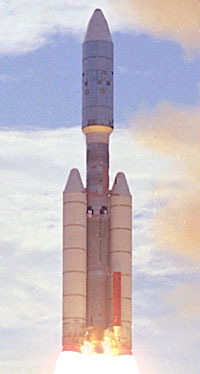 Intended to reach Mars and Venus, the 43.2-meter Molniia had an additional fourth stage, designed by V.P. Mishin. It was the first vehicle to perform Tsiolkovskii's suggested maneuver of launching from a parking orbit into an interplanetary trajectory. This technique, first used by the Soviet Union, increased the lunar payload capacity from 400 kg to 1800 kg and the planetary payload from 200 kg to 1000 kg. To start the fourth-stage rocket engine in zero gravity, a small solid-fuel ullage motor first accelerates, pushing the fuel to the bottom of the tank and preventing bubbles from entering the combustion chamber. 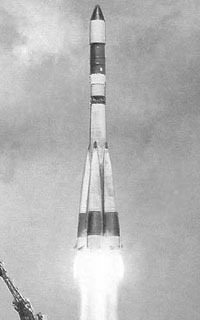 Beginning in 1960, Molniia launched many planetary missions: Venera-1 to Venera-8, Luna-4 to Luna-14, Mars-1, and Zond-1 to Zond-3. These included the first spacecraft to land on the Moon (Luna-9 in 1966) and on Venus (Venera-7 in 1970). Vehicles in this family are still in use, carrying cargo and crew to the International Space Station. Fueled by kerosene and liquid oxygen, the R-7 develops 900,000 pounds of thrust. Often called a "two-stage" rocket, the configuration is actually based on Tsiolkovskii's idea of clustering. One advantage of clustered design is that no engine needs to ignite in a vacuum, all five boosters start at ground level. When exhausted, the four outside stages (B,V,G,D) pivot outward and detach, and the central stage-A sustains thrust into orbit. 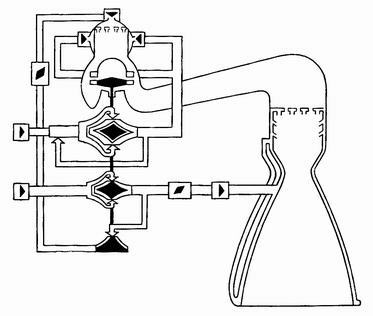 Each engine has 4 bronze combustion chambers, cooled by the in-flow of fuel. One shared set of fuel and oxidizer pumps on a single 8300 rpm driveshaft are powered by a 5100-horsepower hydrogen-peroxide/steam turbine. Heat from the turbine also vaporizes liquid nitrogen to maintain fuel-tank pressure as they drain. Steering is accomplished with small pivoting rocket engines, 4 on the center booster (an RD-108 engine) and 2 on each outboard booster (RD-107 engines). The most important Soviet spaceport is the Baikonur cosmodrome. Actually located in Tiuratam in Kazakhstan, but named after a distant town to confuse Western intelligence. The site contains a tracking station, a ballistic control center, and specialized launch pads for a variety of rockets. The Molniia and Soyuz rockets are launched from a large concrete pad atop a water cooled fire pit. 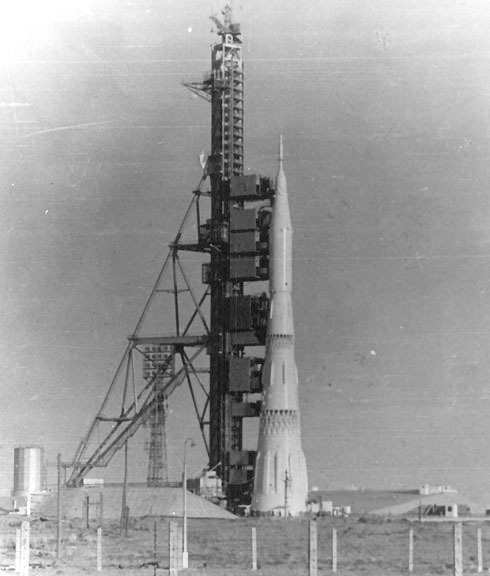 Once erected, the rocket was surrounded by a steel supporting structure called the "Orchid" that unfolded at take off. Heavier planetary missions use the 4-stage version of the Proton. Completed in 1965, it stands 193 feet tall and develops 2.1 million pounds of thrust from six engines. 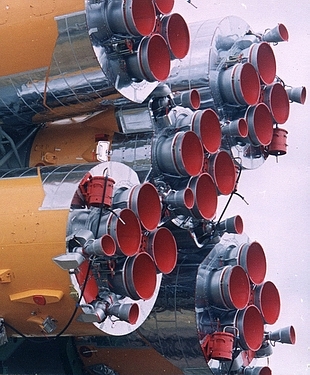 Although it appears to have a clustered design, the cylinders around the base are actually fuel tanks, filled with 1,1-dimethylhydrazine (UDMH). The central core contains the oxidizer, nitrogen-tetroxide, accounting for the orange exhaust smoke. While highly toxic, the propellants have the advantage of not being cryogenic. UDMH is a powerful reducing agent and ignites spontaneously when combined with the oxidizer. This tends to avoid the problem of hard starts (exploding the combustion chamber by igniting the fuel mixture too rapidly). Proton launched Luna-15 to Luna-24, Venera-9 to Venera-16, Vega-1 and Vega-2 (to Venus and Halley's comet), and Mars-2 to Mars-7. Mars-3 was the first spacecraft to land on Mars in 1971, and Venera-9 was the first to photograph the surface of Venus in 1975. The second generation of Luna missions included moon-rock returns and robotic rovers. 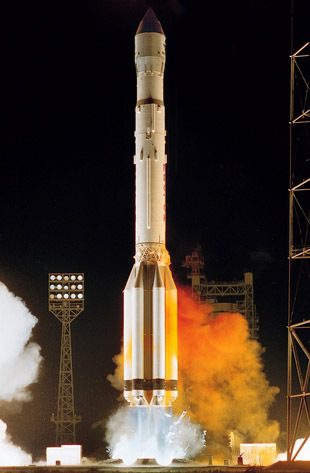 From 1970 to 2001, Proton launched 265 missions with only 21 failures, making it one of the most reliable launch vehicles available today. An important innovation in this rocket was the RD-253, the first closed-cycle engine. Experimental engines of this design were first made in 1952 by A.M. Isaev. A small amount of fuel is combined with the oxidizer in a pre-burner, and the resulting reaction drives the 25,000-horsepower fuel turbopump. The hot oxidizer-rich exhaust enters the main combustion chamber where it combines with the primary fuel supply. Thus the energy in the turbopump exhaust is not wasted. Unique heat-resistant and corrosion-resistant coatings and materials were critical in this technology. The rocket fuel also determines many factors in the specific impulse of an engine (heat of reaction, propellant density, exhaust-gas volume, specific heat, etc). 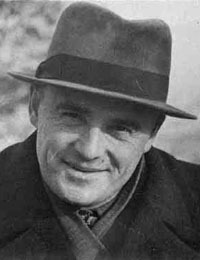 Glushko experimented with upper stage engines for the Proton using liquid fluorine as an oxidizer, and the resulting specific impulse was 25% higher. However, LF2 was too toxic and corrosive to be practical. He also experimented with ultra-high performance fuels such as pentaborane, which also proved too dangerous. Durable and efficient, Russian engines designed in the 1960s remain unmatched in quality. They are not only still in use in Russia, but the latest generation of American rockets now utilize Russian engines. NASA's Atlas III and Atlas V launch vehicles use the RD-180, and the engines from the Soviet N-1 moon rocket are being repurposed for commercial use. In 1958, Korolëv listed the development of ionic propulsion systems as a necessary goal for efficient space travel. The motivation was provided in 1903 when Tsiolkovskii proved that the final velocity of a spacecraft was proportional to the specific impulse of its engine. In 1911, he even proposed the use of electric propulsion. 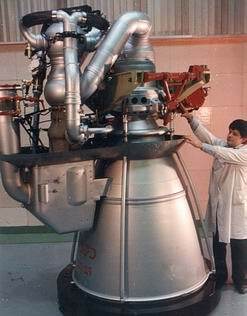 Russians pioneered electric propulsion, producing the first thermoelectric ("resistojet") engine in 1929, and researching plasma and ion propulsion in the mid 1950s. 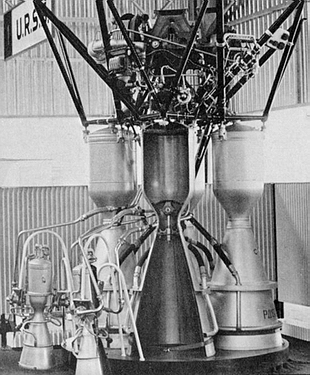 The first application of electric propulsion in space was the Mars probe, Zond-2, in 1964. It used six plasma-pulse thrusters to maintain the orientation of its solar panels. These could be switched on experimentally, or it could use conventional gas jet engines. These engines were highly efficient but produced only a fraction of an ounce of thrust. They used high current pulses of electricity to blast and ionize thin layers of teflon propellant. 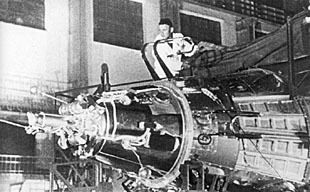 This engine was developed at the Kurchatov Institute by Aleksandr M. Andrianov. 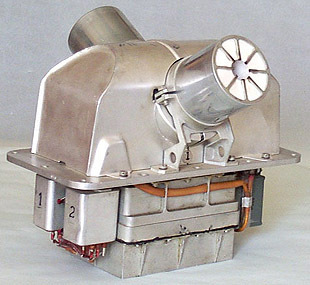 First used in 1972, stationary plasma thrusters have been used to maintain orientation and station keeping of Soviet communications and weather satellites. Flywheels can be used to control orientation alone (first done in Venera-1), but orbital adjustment requires actual thrust. 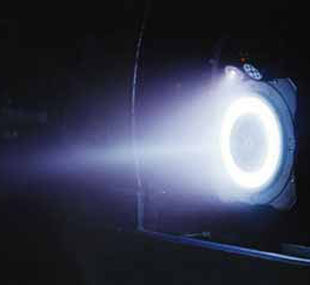 These engines accelerate ionized Xenon with strong magnetic fields, and some models could produce over 40 pounds of thrust. Their specific impulse is about 8 times that of chemical rocket engines. The American planetary exploration program was initially hampered by lesser rocket power, but by the 1970s they had vehicles comparable to the Soviet Proton. The Space Shuttle deployed a few probes, but lifting fully fueled escape stages was later judged unsafe. 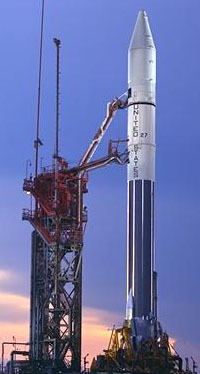 The Atlas was a single stage ICBM, augmented with the Agena orbital-escape stage. At 300,000 pounds thrust, it had 1/3 the lifting power of the Molniia. 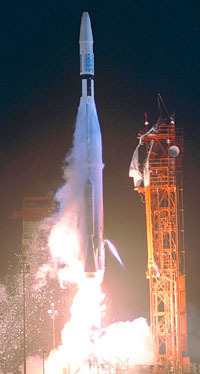 Shown above is the 1962 launch of Mariner-1. The Centaur escape stage was a sophisticated advanced, powered by liquid hydrogen. Its development was troubled and long delayed, which forced a reliance on the small Agena system far longer than desired. Shown above is Pioneer-10 shortly before its 1972 launch. The Titan heavy launcher was substantially more powerful than the Atlas. Seen above is the 1975 launch of Mars probe Viking-1. At 3400 kilograms, it was the largest probe ever launched by the Americans (about half the mass of the Fobos probes launched to Mars by the Proton). "German scientists taken into Russia were obviously not even aware of the large and extensive ballistic missile program that was going inside Russia. They did not, in any appreciable extent, actively participate in the hardware phase and missile development program in Soviet Russia." Nevertheless, both American and Soviet engineers learned from the V-2. 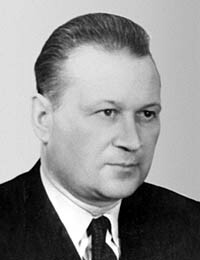 In Russia, there was already a native body of expertise on rocketry, and Korolëv did not wish to partner with the Germans, who were sent home in the late 1940s. In America, the pioneering work of Robert Goddard was underappreciated by the military. After the war, America was initially more dependant on German expertise than the Russians. America also obtained the top German scientists and designers, while Gröttrup and his team were lesser technicians. 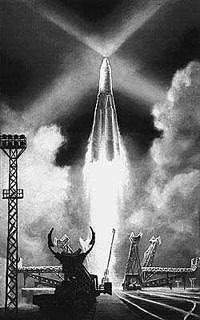 The idea that Soviet accomplishments in space were due primarily to German expertise was a popular cold-war propaganda theme, and one anti-communist diatribe described the R-7 rocket as "five V-2 missiles welded together". Equally absurd statements are based on Gröttrup's drawings of the never-built G-4 missile. 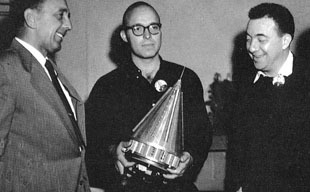 The claim that the giant four-stage N-1 moon rocket was derived from the 24-meter G-4 are based naively on their similar cone-shaped appearance. Designing, building and testing a working rocket is an extremely complex undertaking, requiring thousands of technical experts working on hundreds of systems. For example, it was highly nontrivial to build rocket engines larger than the original V-2 motors. Problems included: fuel delivery, efficient combustion, cooling of the engine jacket, prevention of destructive oscillations, and prevention of explosive engine starts. By the time the N-1 was under construction, the knowledge and experience of Soviet rocket experts vastly outstripped what was known by the Germans in the 1940s. It is inaccurate and unfair to divert the credit for these achievements. Many image are from NASA and come courtesy of their generous non-commercial usage policy. In particular, many are from the web site of David R. Williams, National Space Science Data Center, nssdc.gsfc.nasa.gov. The image of the Zond-3 plasma thruster is courtesy of Michael Kazeev of the Kurchatov Institute.